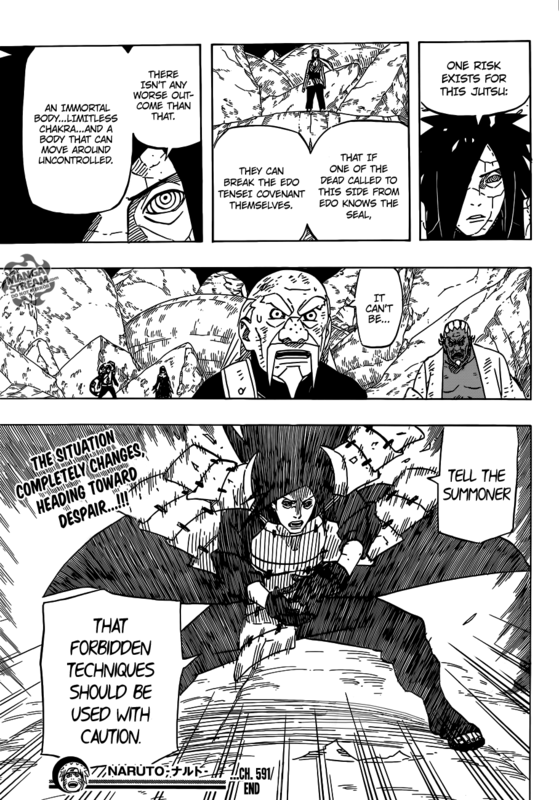 In Chapter 591, we see Madara Uchiha free himself from the influence of Kabuto's Impure World Resurrection/Reincarnation technique (Edo Tensei), saying that he was able to do this because he knew about the technique's seals. However, in Chapter 620, we see the inventor of the Impure World Resurrection technique, the second Hokage, Tobirama Senju, wanting to be free of the technique, but was stopped by Orochimaru. How was it that Tobirama was not able to free himself from the Impure World Resurrection technique, despite being its inventor and knowing all about the technique and its seals, but Madara can? Credits: Linked images are from Mangastream's scanlations. Hashirama: You increased the restraining power using my cells. Tobirama: Now that I sense better, his body is almost made of my brother's cells. 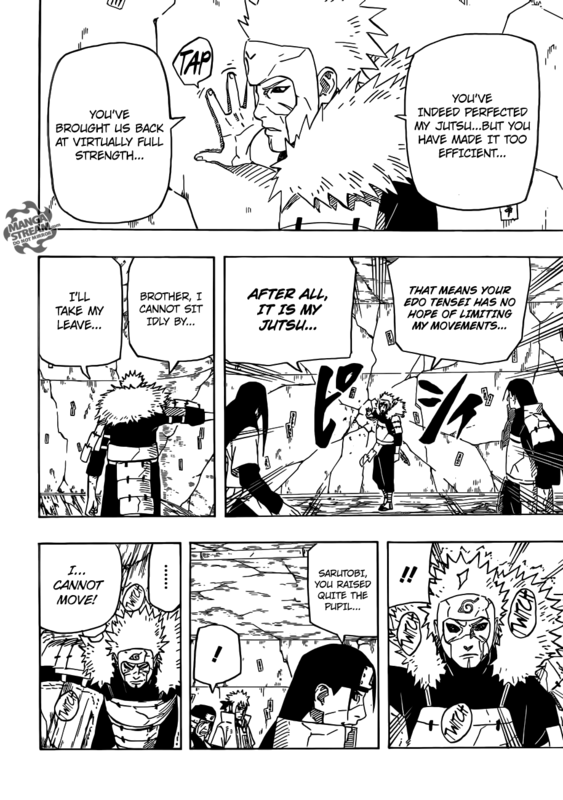 So Madara was able to free himself because no one restrained him before he performed the seal; in the case of Tobirama, he tried to destroy the wall first and Orochimaru was able to restrain him with the increased restraining power he has. If you remember, Orochimaru perfected his jutsu, so when he uses it, it's at maximum strength (as demonstrated in both the fight with the Third Hokage and the restraint of the Second Hokage). Now the reason for Madara getting released was that Kabuto didn't know how to use the jutsu well, as seen by the lack of control over the reanimated and the fact that it takes a huge amount of chakra to be able to have utter control (which Orochimaru had but Kabuto lacked). 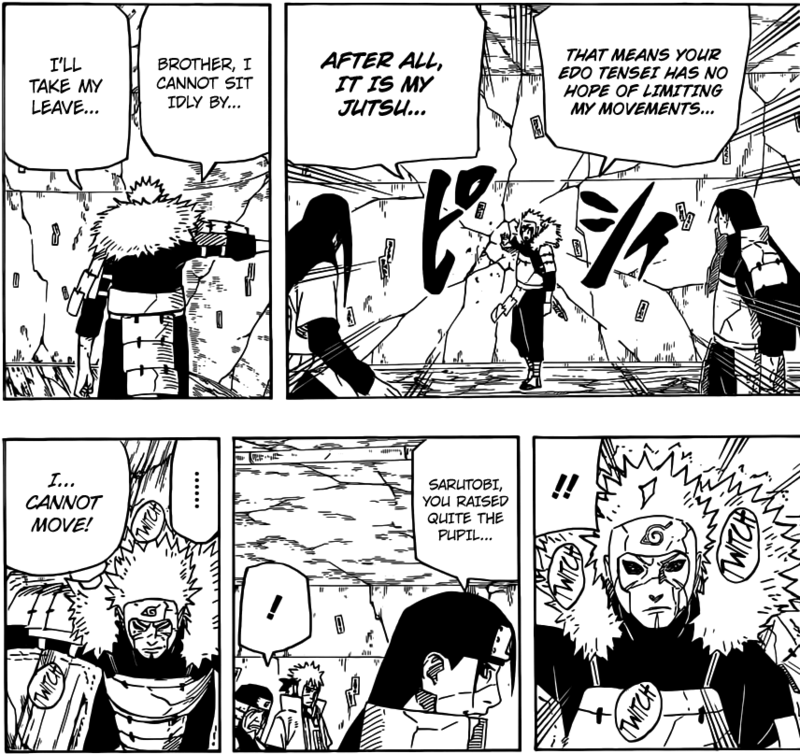 Another reason is the fact that Kabuto released the Edo Tensei, which basically gave all the reanimated the chance to perform the hand signs and stay, as Madara said to Tsunade. Madara was released from Edo Tensei and he used it then again on himself. He couldn't free himself, Kabuto just let them go very loose. It is impossible to break the "chain" from the summoner and so, when the summoner restricts the movement, the summoned can't do anything against it. For further information on how Madara is still there after he was released please refer to this question. Clue 2 Hashirama: ahahaha! He used my cell to amplify the restraining properties of the edo tensie. 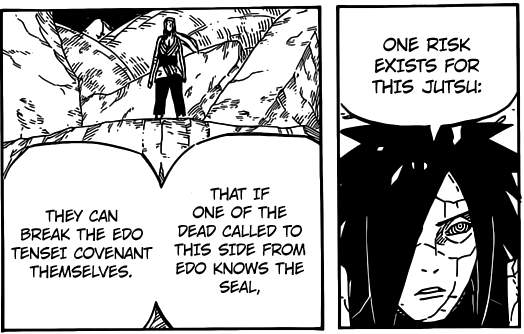 Like Hashirama, who can move freely while on Orochimaro's edo, Madara has the cell of Hashirama to cancel/negate the amplification to the restraining properties of Kabuto's edo + the knowledge of edo's seal. That's because you seemingly need to know and perform the technique itself, on yourself. Orochimaru blocked Tobirama's movements, not allowing him to perform the hand-seals necessary to activate the technique. How can Madara still stick around even after the Edo Tensei had been ended? Does Summoning: Impure World Resurrection automatically equip the reincarnated shinobi? Couldn't Kabuto have un-summoned Itachi? Why did Tobirama create Edo Tensei? Did Obito let Kakashi win?